Guest Posts: Guest Posts are written articles by other bloggers and readers who provide all content for the post. At times, I may be searching for specific content that other bloggers and readers may be able to offer. I recently started accepting Guest Posts at all times. Guest posts will NOT include a link to any business or 3rd party website (at which they would be considered a Sponsored Guest Post – details below). Guest Posts will include a link back to your blog or a selected social media profile (Social Media choices are intended for Reader Guest Posts). All posts must contain new content not found anywhere else on the internet, contain at least one high quality image as well as 300+ words. Credit will be given to the author along with a link and possibly a small bio, if provided. 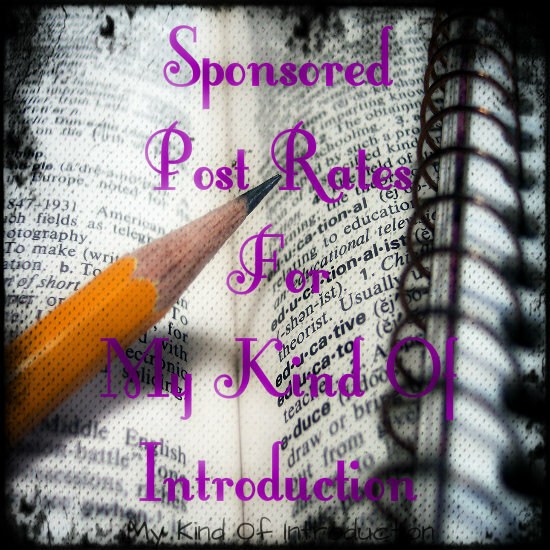 Sponsored Guest Posts: A Sponsored Guest Post is where you (the sponsor) provides all content, which includes one link to your business or website. Each post must contain NEW content (never posted online), contain at least one high quality image, and 200+ words. Credit will be properly given to the author via name and backlink. Option 1 - An article with 300+ words as well as up to 3 links to your business(es) and/or websites, where I provide all written content along with the image(s) acquired from Sponsor, if possible. Option 2 - Sponsor provides all written content as well as high quality image(s), I will post the content as I see fit while adding a backlink to your business and/or website. *If you happen to be interested in more than one sponsored post, scheduled throughout a period of time, arrangements can and will be made to insure all posts are scheduled in a timely manor and that price arrangements are agreeable for both parties. Contest or Sale Post: If you have an upcoming promotion, sale, special coupon and/or contest, you've come to the right place! You provide the content and I'll do all the work! I will add your promotional information to a short post including all important details (provided by you). I'll promote your contest/sale post via social media throughout the week of the live post. Press Release/Info-graphic: I will create a post sharing your press release and/or info-graphic with my readers. All Posts will be promoted throughout the week of the live blog post. When it comes to Sponsored Posts, all added links will be “nofollow”, there are no exceptions. All payments must be submitted to AutoFaerie@gmail.com via PayPal. An appropriate disclosure will be provided at the top of all sponsored posts per FTC regulations, this is required and no exceptions can or will be made. I look forward to hearing from you all very soon! !